DENVER FIREBALL: Something from space disintegrated over Denver, Colorado, this morning around 6:20 am MST (1320 UT). Witnesses describe it as "brilliant, slow, twinkling, sparkly and full of rainbow colors." It was not a meteor. The fireball was the decaying body of a Soyuz U rocket that launched the French COROT space telescope on Dec. 27th. The re-entry caused no damage on the ground--just a beautiful display in the sky. More: news video, ground track, amateur photo. 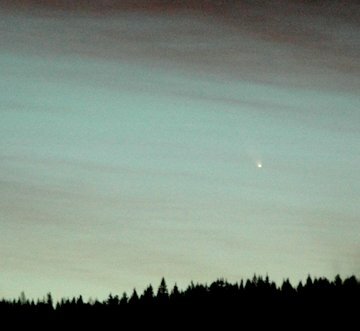 "This morning (Jan. 3rd) the comet was faintly visible to the naked eye before sunrise at an altitude of 4 degrees (the sun was 10 degrees below the horizon)," reports photographer Haakon Dahle of Fjellhamar, Norway. "The photo," he says, "resembles the view through binoculars." More information: finder chart, ephemeris, 3D orbit. Soon, the comet will be too close to the Sun to see--unless you're SOHO. From Jan. 11th to 15th, the Solar and Heliospheric Observatory will monitor the comet-Sun encounter using its onboard coronagraph. A date of note is Jan. 14th when Comet McNaught passes less than a degree from the planet Mercury. Join SOHO for a ringside seat. 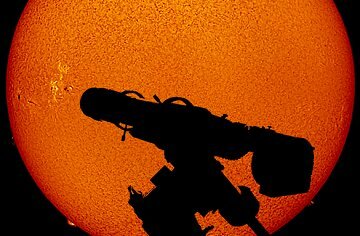 "I took this picture on Jan. 2nd using my Coronado SolarMax90," says Greg Piepol of Rockville, Maryland. In the foreground, he silouetted his telescope for dramatic affect. "I call it 'Taking Aim.'" more images: from Franck Charlier of Marines, Val d'Oise - France.